Mattress Mick’s got nothing on this. This is the greatest gathering of mattresses you’ve ever seen, taking up most of the floor space in a warehouse in Glasnevin. With stacks and stacks of the things 20 and 30 deep, even the most sensitive of princesses could get a decent 40 winks here. If it wasn’t, that is, for the occasional high-pitched squishing noise coming from the machine that bales-up mattress innards in preparation for recycling. Eco Mattress does two very valuable things simultaneously. As a social enterprise, it provides jobs and hands-on work experience for people in the north inner city. 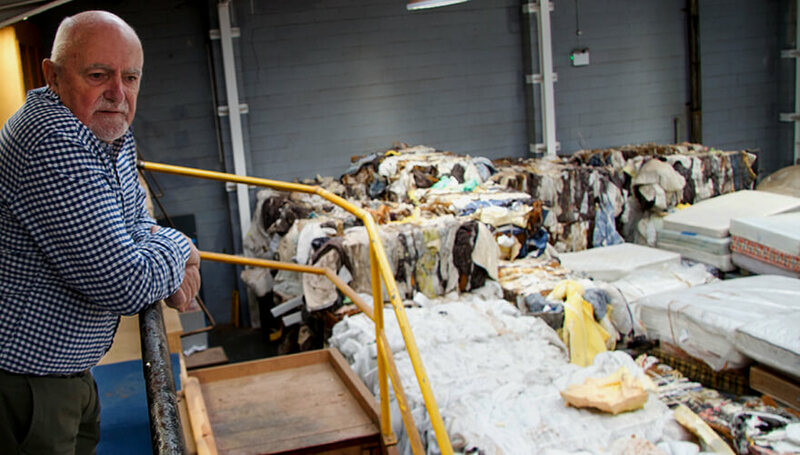 And it recycles old mattresses, saving thousands of tons of material from going into landfill. From steel springs to polyurethane foam to fabric, every part of the mattress is recovered for use in industry or as fuel. There’s probably only one man in Ireland who could have come up with an idea like that. At the warehouse next door they call him ‘the mattress guy’. His name is John Scally and with 38 years of experience in waste management plus several more in community training schemes, it’s hard to imagine anyone better qualified to do what he’s doing. ‘I’d been involved with the locals in the north inner city’, says John. ‘We were using waste management and recycling as a vehicle for some community projects. Then after I retired from the council I joined up with Sunflower Recycling. We were producing some very good employees down there, through the community employment projects’. The trouble was that being a very good potential employee didn’t mean you could get a job. And this was at a time, ten years ago, of ‘full and plenty’ as John calls it. ‘We were not able to get them employment, even part-time employment or work experience that would get them back into the groove’. Or maybe into the groove for the first time. As John points out, ‘some of our people would never have had the experience of seeing someone in the family leaving the house to go out to work’. ‘We may have been training them up to be lorry drivers’, he continues, ‘we may have trained them up to be fork-lift truck drivers, prepared them for work, and I would have been happy to send them anywhere because they were capable. But we couldn’t find employers who would take the next step with them.’ At which point John began ‘to get a bit fed-up. So I thought, okay, we can’t get it, let’s produce it ourselves. And then I set about thinking how we could achieve this… I knew myself we had to find some kind of niche thing because we couldn’t compete against the big guys’. That’s when the mattress-recycling brainwave struck. ‘At that time mattresses had come to be a bit of a pain in the neck for people who were dealing with getting rid of them’. There was no research available on the subject, no facts or figures. But that didn’t stop him. ‘I hadn’t a clue how I was going to do it’, he says, ‘but I knew that I was going to do it’. After a lot of exploratory work, John was in a position to put the idea to John Gormley, Minister for the Environment at the time. Gormley asked for a more concrete proposal and an estimated startup cost. Not long afterwards, the money he needed came through. It was the only grant he’s ever got, he says, but a very welcome one nonetheless. Within a year or so John was able to hire his first full-time staff member. He’s not interested in how long someone might have been out of employment or how long ago they finished an employment scheme. He doesn’t ask questions. ‘The only questions we ask when someone comes in that door is ‘do you want to be here?’”, he says. ‘This is what we do. This is all we do. There’s nothing more than what you’re seeing. So do you want to be here? If the answer is yes, they’re in here’. 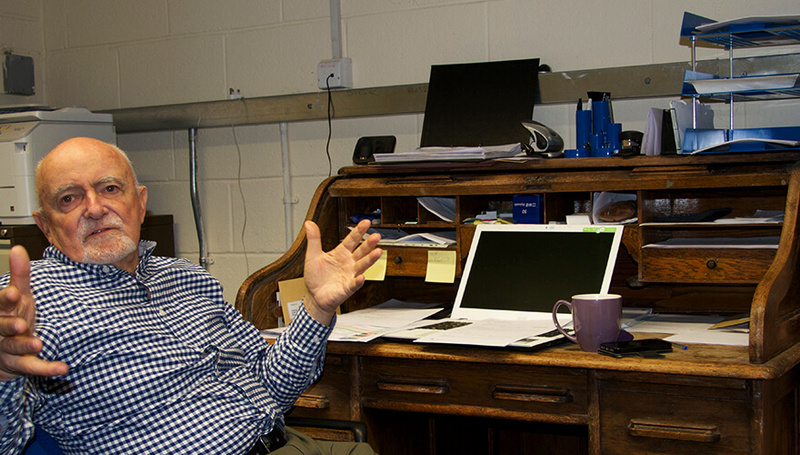 Currently the business employs six people full-time – along with others who are here as participants in back-to-work schemes. The jobs pay above minimum wage. That’s because John doesn’t want anyone ‘pointing the finger and saying we’re using people. It’s the other way round. People use us to get to where they want to go and I’m perfectly happy with that’. The guys on the floor are happy to share a joke with Dublin.ie – but they don’t stop working while they talk. Apart from the baling, all the work is done by hand: the speed at which an individual bedspring can be recovered is all down to manual dexterity and how good you are with a pair of pliers. ‘They work harder than people in your usual job’, John reckons. So what, we wonder, are the logistics of Dublin’s mattress-recycling sector – of which John’s business is the only member? ‘We have to get rid of six or seven hundred mattresses a week’, he says. ‘We don’t accept here from the public, we pick them up ourselves in one of our vans. But it’s no good getting 700 mattresses in if you can’t get 700 mattresses out. 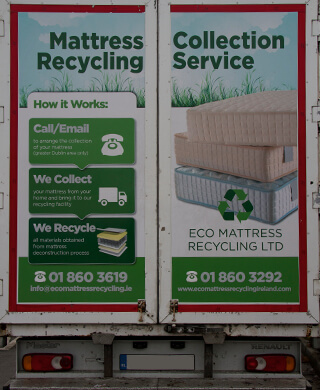 So that’s what we do: we’re the Dunnes Stores of recycling mattresses!’. He says it one more time as Dublin.ie takes its leave: ‘It has to work’.